ABOUT THE FRUGAL & FUN FT. WORTH WEEKEND EDITION Fridays, we post ideas for FREE (or really cheap) weekend entertainment for you and your family. Subscribe to our blog updates and you’ll receive this weekly weekend guide along with more budget stretching ideas and tips throughout the week! Subscribe for FREE (here)! FREE Smithsonian’s Museum Day Live ~ Get 2 FREE tickets to a long list of museums in DFW and other world-class cultural institutions around the country. FREE Entrance to Fort Worth’s Top Museums at Day in the District ~ Enjoy free admission and family events at 10 destinations throughout the Cultural District. Fun! Texas State Fair at a Discount ~ Pop over to Dallas for the Grand Opening weekend of the annual State Fair. FREE Admission to All National Parks ~ Enjoy all national parks on National Public Lands Day for FREE. FREE South St. Art Festival in Arlington ~ showcasing 75 juried artists and a full schedule of live music. FREE Rock the Park Family Event in Keller ~A fun & FREE event for the entire family. FREE Autumn Container Gardening Class at Calloway’s ~ Combine classic harvest elements to decorate your home and garden. FREE Cowtown Opry Performance ~ Enjoy vintage and contemporary western music in the Fort Worth Stockyards. Museum Day Live is an annual event hosted by Smithsonian magazine in which participating museums across the country open their doors to anyone presenting a Museum Day Ticket…for FREE. You do need to sign up to get your 2 free tickets ahead of time, here. What: Learn more about National Museums Day, here. To get your free tickets (limited to 2 tickets), go here. Where: Find participating museum locations around the country, here. Cost: FREE with museum tickets. What: Learn more about the 10 participating venues here. For the complete schedule of special programs and events at each location, click here . Where: For a map and venue location details, go here. Cost: FREE all day. Go here to learn about free parking and transportation by The T.
This is the grand opening weekend of the month-long State Fair of Texas entertainment extravaganza in Dallas, and you can attend for FREE or cheap (learn how here). The Texas State Fair runs now through October 20th and covers just about every area of interest. There are literally hundreds of entertainment choices and music performances throughout the month including many well-known names. There is something for everyone! What: Check out daily line up of concerts here, the list of celebrity chef demonstrations here, and the full schedule of events here. Cost: Go here to learn how to get FREE or cheap discount tickets. This Saturday, the National Parks are offering FREE entrance in honor of National Public Lands Day. As part of the celebration, you can enjoy any of our almost 400 National Parks for FREE. Do note that not all national parks charge fees, but those that do will waive their costs these days (for example, $20 a car at Big Bend or $25 a car + $12/person at Yellowstone ). There is a long list of participating locations within a drivable distance of Fort Worth, here. What: Go here to learn more about this national event. Where: For a list of participating national parks in Texas, go here. Cost: FREE at all locations! This weekend, launches the 1st Annual South St. Art Festival in Downtown Arlington. The festival showcases 75 of the nation’s finest artists at this juried art show. You’ll also find savory food, live concerts, performance artists, and more! What: Learn more about South St. Art Festival here. Where: East South St. in Downtown Arlington. The main entrance to this festival is on Mesquite St. with other entrances at Elm St. off of Border St., Elm St. off of Abram St., and East St. off of Border St. When: September 27-29, 2013. See the full schedule here. 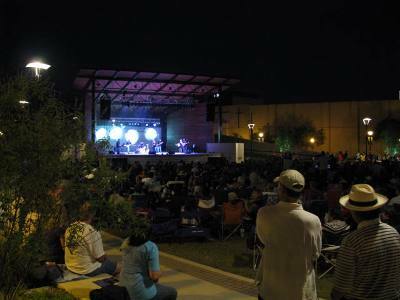 Join your family and friends for an evening of FREE music at the Levitt Pavilion in Arlington – part of their fall series of free music and performing arts under the stars. Be sure to bring along a lawn chair or blanket to enjoy the outdoor entertainment. Snacks or a picnic dinner, and beverages are allowed, but no glass containers, please. This weekend’s line up includes: Grammy-winning country/crossover master Ronnie Milsap, country artist Deryl Dodd & the Homesick Cowboys, and bluesy favorite Mingo Fishtrap. What: To learn more about the Levitt Pavilion’s fall concert series and weekly artist line-up, click here. Where: Founders Plaza in Arlington, 100 W. Abram St. (Corner of Abram and Center streets, directly across the street from City Hall). View the parking map for free parking options. When: Friday to Sunday. See complete schedule of concerts, here. Cost: FREE admission (food is extra). The City of Keller is hosting a fun family friendly celebration this Saturday at Bear Creek Park. There will be plenty of live entertainment for all ages including bounce houses, a petting zoo, climbing wall, food trucks, fireworks and much more. Make sure to bring your blanket or lawn chairs to enjoy your favorite music. What: For more info, go to the Keller Rock the Park website. When: Saturday, September 28, 2013 ~ View the schedule of events here. This Saturday, Calloway’s Nursery is hosting a FREE class focused on combining classic harvest elements to decorate your Texas home and garden. You’ll discover how to combine old favorites and a number of brand new plants into gorgeous container gardens. The event is FREE and open to the public. What: For more info about Calloway’s and this event, click here. When: Saturday, September 28, 2013 ~ 10:15am. Where: Any Calloway’s store location in DFW. Find a store near you, here. Hear classic western music come to life as Cowtown Opry members perform a free music exhibition on the steps of the Livestock Exchange building. This live family friendly music event will take place every Sunday and will feature a different theme each week ~ Western Gospel music will be featured on the 5th Sunday of the month. What: For more information, visit the Cowtown Opry website. When: Sunday, September 29, 2013, 2:00PM. See the complete performance schedule here. Where: The live performance will take place on the steps of the historic Livestock Exchange building ~ 131 East Exchange Ave. in the Fort Worth Stockyards National Historic District. We hope you have a fantastic weekend! This entry was posted in Dallas, Entertainment, Fort Worth, TX, FREE, Frugal Fun in Fort Worth (Cheap/Free Entertainment Ideas) and tagged Day in the District Fort Worth, Family Fun, Fort Worth, Fort Worth Museum, FREE. Bookmark the permalink.